Are you confidence to determine online work from home scams? 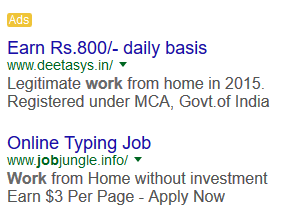 Almost 2000 plus website in India are now offering Work from Home Jobs, but very few are real! 95% of people from India are failed to find the deference between a real work from home jobs and work from home jobs scams. So today we have 10 tricks that defiantly help you to judge the real online work from home jobs. Recommend Read: How to Detect Online Job Scams in India? 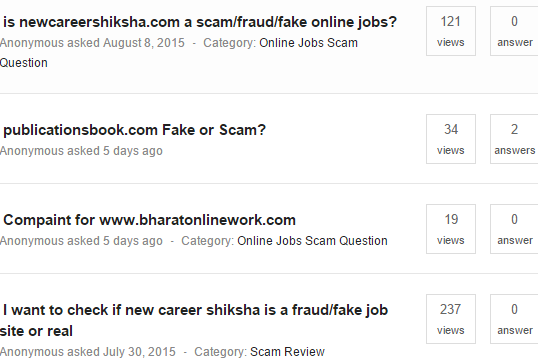 We are now too popular in India for sharing awareness on work from home scams. We have plenty review on various work from home websites. Before make a decision to join for any work from home jobs in India first read our work from home scams review, not enough you can asked any question regarding work from home scheme to our Scamdesk Question answer forums. We promise to answer your question within 4 hours. Many of people already asked lots of question even you can search your desired work from home jobs website or company name to find possible answer quickly. We have notice that work from home scammer has the tendency to start a new scam website in each month. As many people now start reviewing and complaint against work from home scams websites, so scammer try to hide their complaints by changing their domain name. So what we can do! just copy the domain name and check domain age from here. You can able to see exact data of registration and domain owner name, if you found the domain age is between 7 days – 1 year that means it’s a new online jobs scammer. Google adwords is the best way that scammer use to scam innocent people’s money. We have notice that most of scammer start a fresh website and spend lot of money in Google adwords. It’s caused innocent people to be a victim by the online jobs scammer. After collect 5-10 lakhs registration fees, scammer quite their website and start a new website and reuse Google adwords to looting money in the name of work from home jobs. Read: Does Google AdWords‎ Help India Online Jobs Scammer? Google page Rank: Always trust those domain having page rank up to 3. Alexa Rank: As per website daily traffic Alexa provide a rank to each website. I recommend to join or trust those website has alexa rank between 50,000 , you can see that moneyconnextion , scamdesk has a good alexa rank as most of the people trust us as we offer genuine work from home jobs tips. Scamdesk review: We Already naked 200plus scam websites, may this time you found work from home scams websites into our review list, check this out here. Consumer Complaints: Visit consumer complaint website and search with domain name or company name, check out what other customer compliant against them! There is some scam website does not allow anyone to contact them, So before Join in any work from home jobs scheme make sure to check their contact number, contact person name. Try to call them several time randomly in day, if any company offer scam online jobs may be you found their number as switch off. Try to prank them by asking such a stupid question like , Why are you faking innocent people , Return my money , I make police complaint against you guys, I know you are fake etc. , if they cut the phone call or filling embarrassing then it’s a definitely a work from home jobs scams website. Don’t just believe by making phone calls, try to meet the real person or talk to the owner of the website. Always double check everything before start a online jobs. Visit their office and take you time to meet everyone associated with business. Does they offer any live training , asked them to call you for training also make sure that they have separate customer care office to get support in case you have a problem to handle their works. I have seen many of time that fake company never allow any online training or office training. They are always tried to escape from you. Try to search domain name review or domain name complaints any see what other saying about them , if any one’s website offer scam work from home jobs then may be some of victim pen down some of their opinion and review , read them carefully. If most of the complaint say that the website is fake and operated by scammer they you must avoid them. ISO is stand for Standard of a service , but most of work from home jobs provider upload fake ISO certificate into their website and misguide innocent people by believing them as genuine online jobs , you can see their will be a link of core website or ISO provider name, Google it! 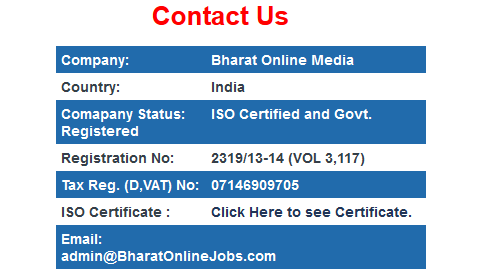 To contact them and asked clearly that is this ISO certificate is real or fake one. Soon you will get your answer! So you are plan to earn a lot of money and someone promise you to earn that much , did you think about how they manage to pay that much amount, asked them to show their outsourcing details , study how they going to provide you so much money for doing some simple works. finally if every think is perfect then asked them to provide some reference people number who are already are in beneficiary to get paid from their website. REMEMBER, if any website does really pay lot of money to their member then they never fill uncomfortable to showing some of the member name and contact number for reference and review. Plan to start a passive income by doing work from home jobs is an excellent idea , but everyone worry about work from home scams , hope our tips will defiantly help you to detect fake work from home scheme. If you have any suggestion or any more idea that you want to share with scamdesk reader , just put it on comment section.